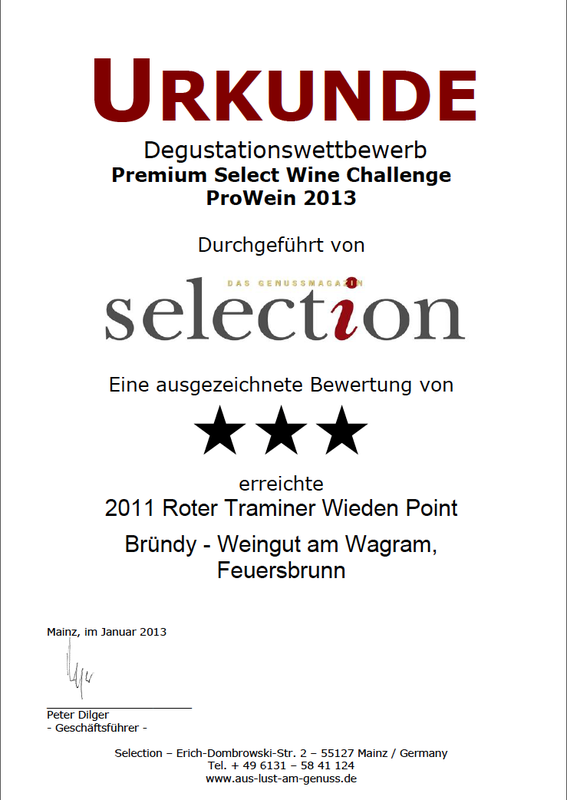 We are proud to announce, that the red wines from the Wagram can resist too. 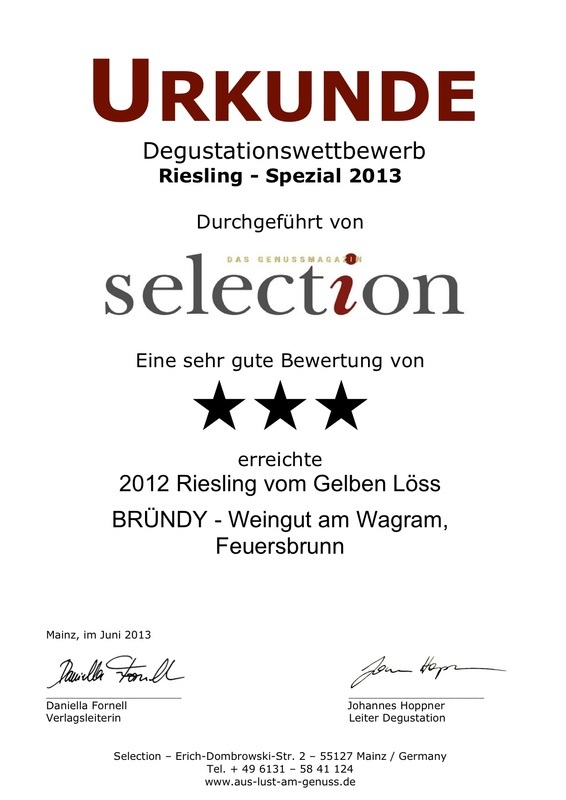 Our Blauer Zweigelt Bründlgraben as well as the Blaue Zweigelt Deiblhof will be published in the »Fallstaff Rotweinguide 2014« and are evaluated excellent. Harvested on 23rd of september, slowly fermented, filtrated on 19th of october, and filled into bottles exactly one month after harvest! 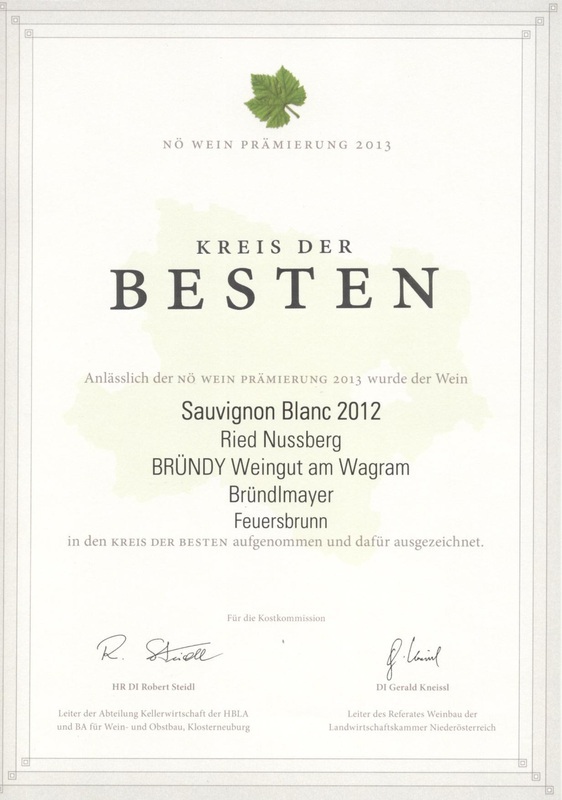 Our young wine, a cuvee of Grüner Veltliner and Sauvignon Blanc appears in bright yellow, smells like yellow apples and is easy to drink with only 11 % alc. and stimulating acidity. 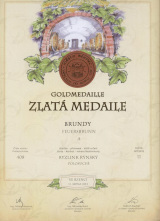 A tight and small palate. 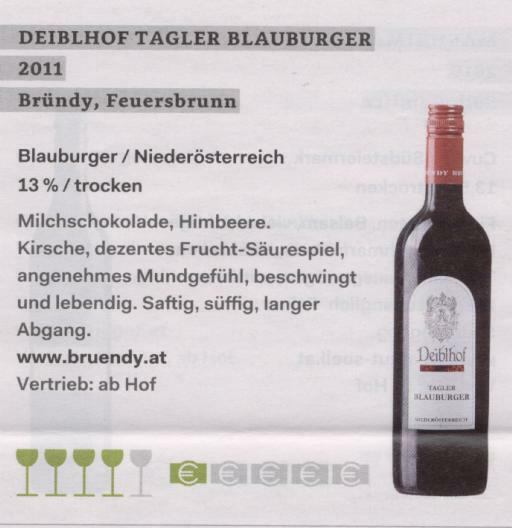 Short and aromatic finish. 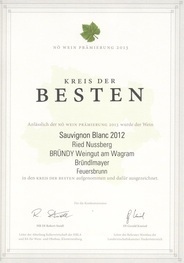 At a winetasting in our neighbouring country our Riesling vom Gelben Löss 2011 assured the jury. We are proud to have international success. At the winetasting »Premium Select Wine Challange 2013« and the »Riesling - Spezial 2013« from the magazine »selection« our wines were very well rated. We received three stars (excellent) for the Chardonnay Holzweg 2012, Sauvignon Blanc Nussberg 2012 and the Riesling vom Gelben Löss 2012. 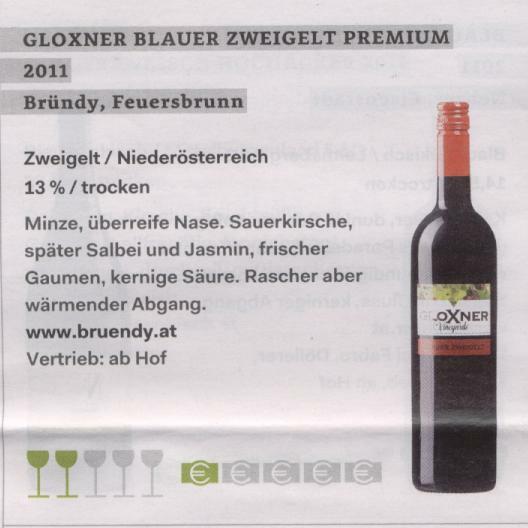 This year we are excited because of an excellent evaluation in the current Falstaff wineguide! 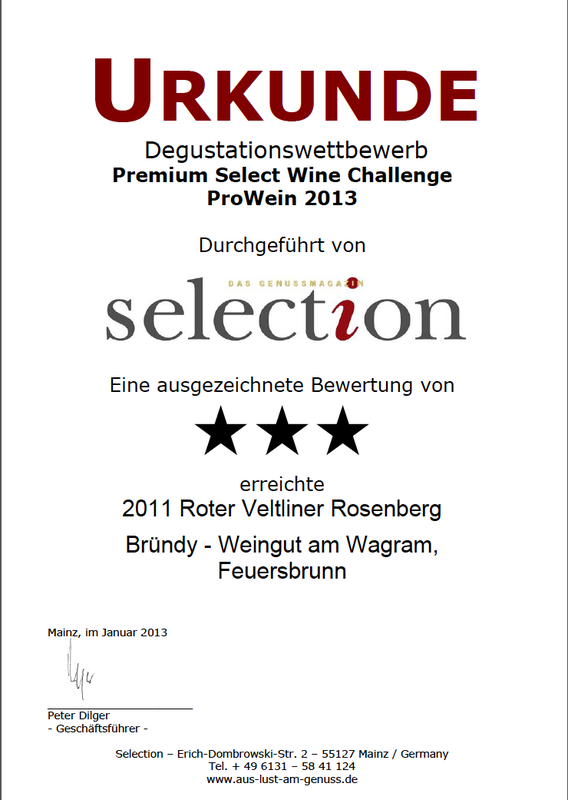 The Roter Veltliner Rosenberg 2012, as the Sauvignon Blanc Nussberg 2012 had reached 90 points. 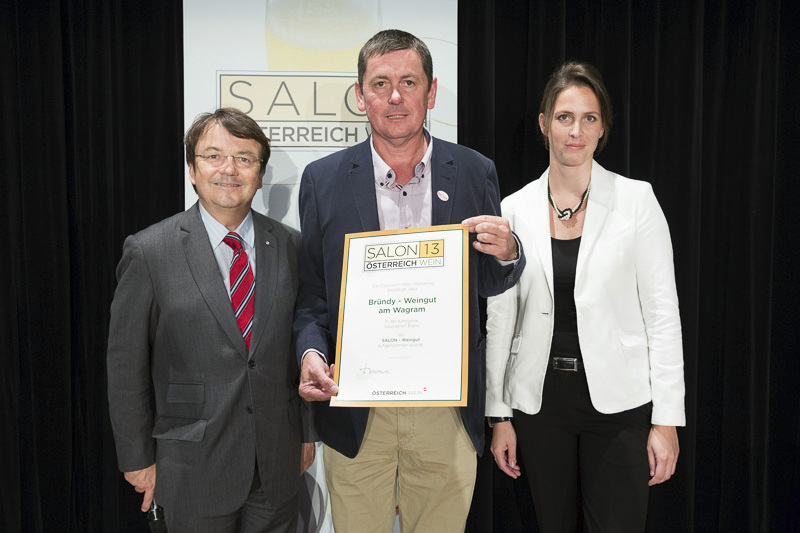 Our Sauvignon Blanc 2012 passed the hardest austrian wine-competition, and we were awarded as »Salonwinzer« at the Casino Baden on 26th of June. 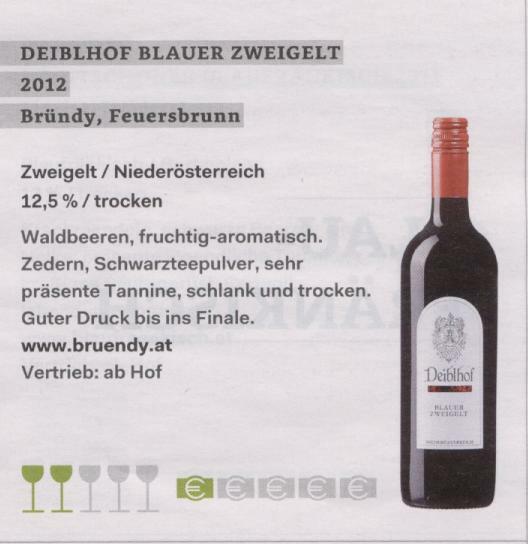 This year we are again cited in the magazin wein.pur »Besto of Austria«. 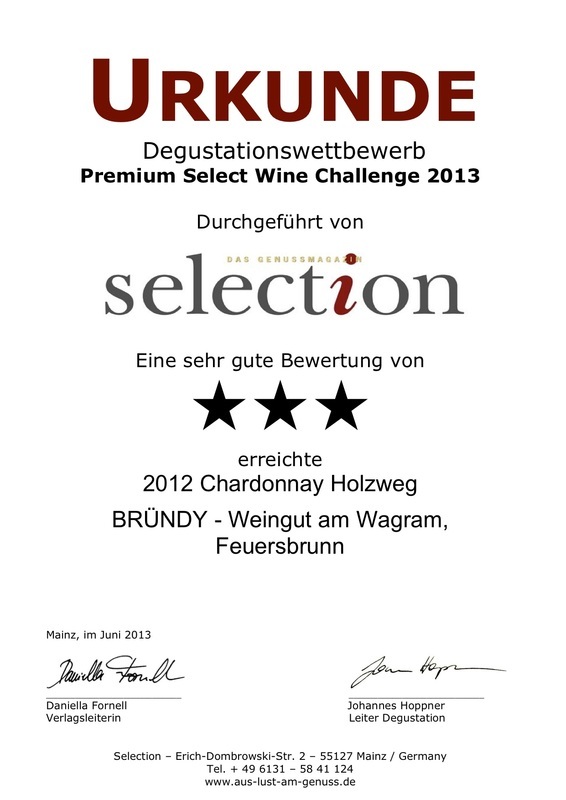 The editorial staff was especially impressed of the Chardonnay Holzweg. 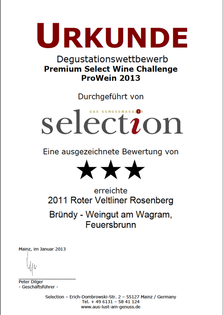 As well as the Gemischter Satz Ried Breitl 2012, Roter Veltliner Rosenberg 2012, Riesling vom gelben Löss 2012 and the Blauer Zweigelt Bründlgraben 2012 were mentioned. 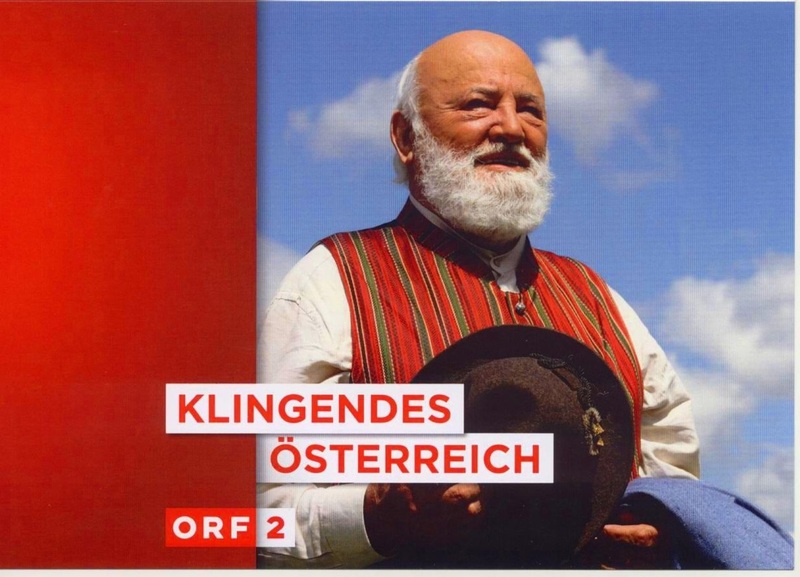 The new episode of the telecast »Klingendes Österreich« is focused on lower austria and vienna and is called »Das große Land«. For this reason, the presenter Sepp Forcher and the staff of the telecast visited the wagram and feuersbrunn and took some shots. 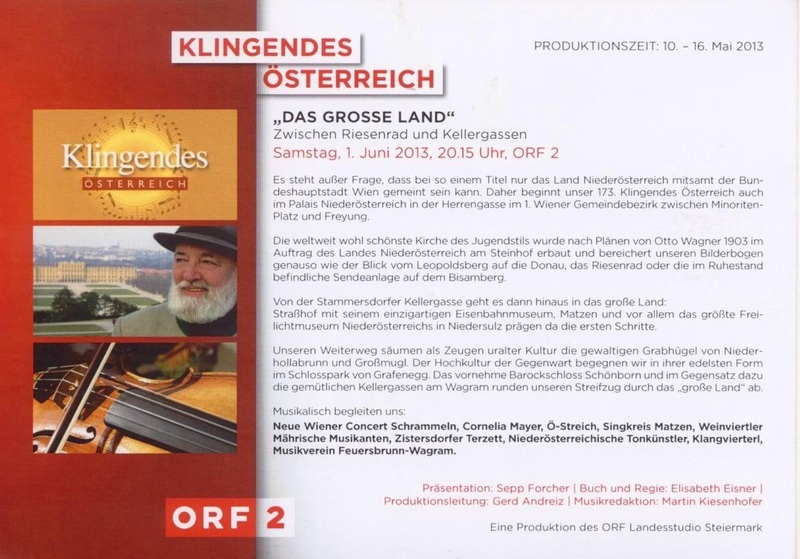 You can see this episode on saturday, 1 june 2013, 8:15 pm, ORF 2. Enjoy our beautiful landscape! 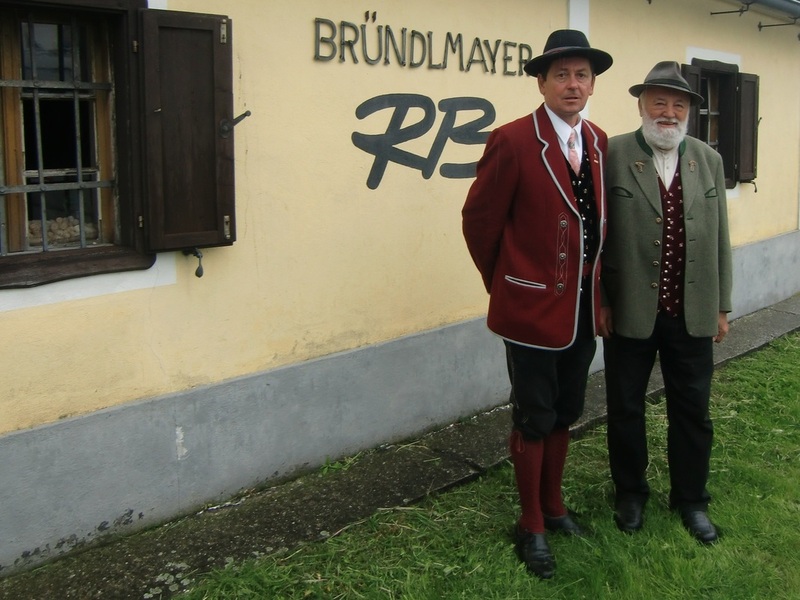 Rudi Bründlmayer, chairman of the music for brass instruments, with the presenter Sepp Forcher in front of our wine-cellar! The new vintage is bottled! Die neuen 2012er Weine zeichnen sich durch Dichte, Kompaktheit und Fülle mit angenehmer Säurestruktur aus. Es sind kräftige und finessenreiche Weine, die uns noch lange erfreuen werden. Ein Jahrgang mit hohem Lagerpotential. Nutzen Sie die Chance bei einer der nächsten Veranstaltungen (Termine siehe rechts) diese zu verkosten. 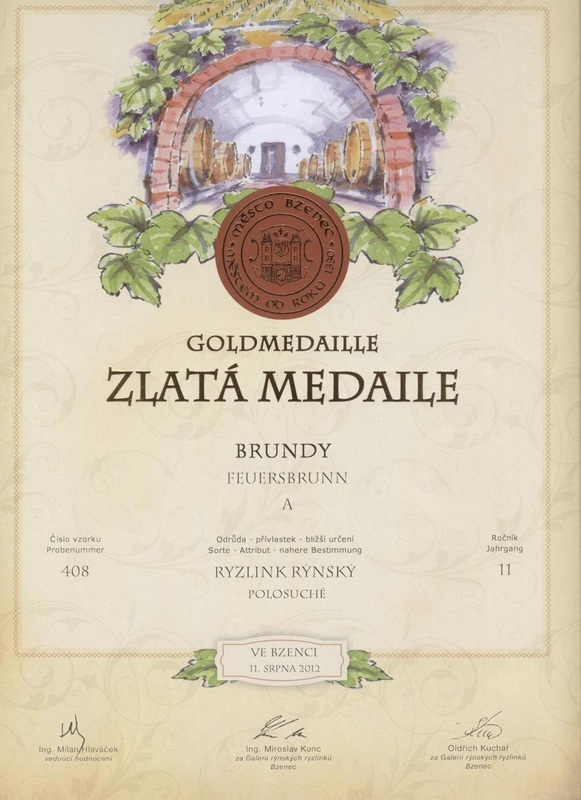 Enjoy our new vintage at our vineyard!